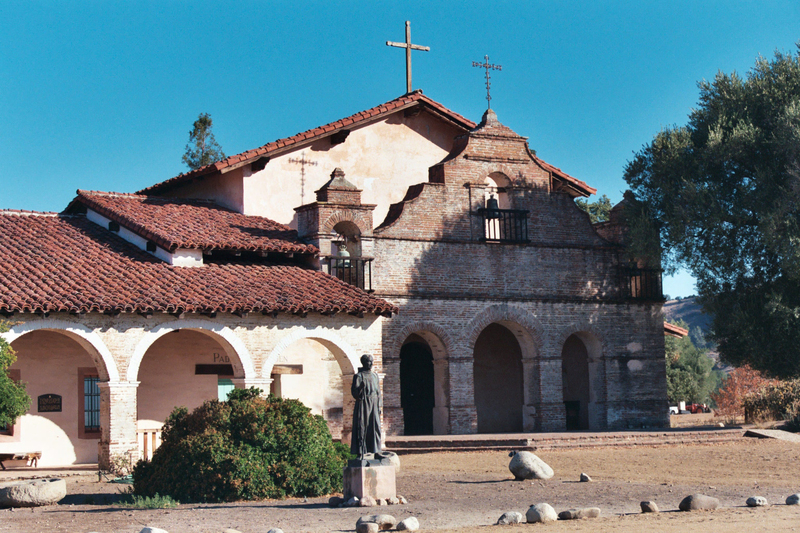 The historic Mission San Antonia de Padua in Monterey County, California. The Mission is the sponsor of an annual living history festival. Monterey County, California, (population 401,762), is located on the state’s central coast, bordered by Monterey Bay on the west and the Gabilan mountain range on the east. Monterey County was created when California became a state in 1850. Three Indian tribes originally populated the coastal and valley regions, making the area attractive to Spanish missionaries. During Spanish and Mexican rule, California’s capital was located in the city of Monterey. In the 1860s the dominant hide-and-tallow trade was replaced by dry farming, due to a series of droughts that destroyed the rangeland needed to support large herds of cattle. Seaports at Monterey and Moss Landing enabled farmers to get the county’s grain to market. The railroad’s arrival in 1872 opened up homesteading opportunities throughout the Salinas Valley. Among the county’s historical attractions is the Agricultural and Rural Life Museum, which features an exhibit barn, blacksmith shop, one-room schoolhouse, restored farmhouse, restored train depot, History of Irrigation exhibit building, and a tractor/harvester exhibit building. The Monterey County Historical Society operates the Boronda Adobe, built in the mid-19th century, which was restored as a museum in 1976. The adobe is listed on the National Register of Historic Places. A series of brochures also highlights historical sites and attractions on self-guided drives through the area. The region offers a number of annual celebrations, including a living history festival sponsored by the Mission San Antonia de Padua. The Agricultural and Rural Life Museum hosts Valley Heritage Day each July 4, featuring demonstrations and hands-on learning opportunities, and the Carmel Valley Historical Society sponsors an annual Cowboy Show.